In tiny Kelley, a town of only 300 lying undisturbed in the surrounding Iowa corn, there is a legend. On the main drag into town is the famous Kelley Phone Booth. Classic silver with red painted highlights, the booth evokes a bygone era, a stamp in time and a story. Maybe it was the place where a sweaty, dark suited old salesman stopped to call in his last order from the road. Maybe it was the spot where a son, hitch hiking his way home stopped to call his mother to stop her from worrying. Maybe it was all these things, but then, maybe it’s just a novelty. As the story goes, you need only stop to take pictures of the booth and it will ring. Maybe not right away, but it will ring. Startled, you’ll answer and that’s when you’ll hear the voice of the legend Pat Kennedy. For decades, Pat has monitored the booth from the side window of her well-manicured home, and every so often someone does stop to take a picture, or now to view the telephone mural. That’s when she springs into action, calls the phone and welcomes the new visitor to town. Sometimes it’s just a hello and welcome to Kelley, sometimes it’s more, and on this day, we got the full dosage. We stopped by the booth on a beautiful blue-sky weekend morning. We were on our way to another attraction but had to stop and see the famous telephone booth. We killed some time posing inside the phone booth, and in no time it rang. I picked it up only to hear silence, then Victoria. Twice again, and we were ready to give this whole thing up as lost travel story. Just then, as we were about to pack it in, a Buick came roaring up the street carrying seventy-something-year-old Pat Kennedy who yelled that she “sure was glad she cleaned it yesterday!” and immediately apologized for not being home to call us. Pat’s a tiny, feisty lady, wrinkled ONLY on the outside. She has bright (false) teeth as white as her hair, which she told us she just cut herself. I’m not sure I’ve ever met someone so upbeat, this woman was absolutely unflappable. She bounced from story to story, giving us only a few moments to comprehend before leaving us hanging at the cliff as she started her next story. She shared everything from her love for the booth to the recent loss of her husband and kept referring to the old grain elevator as if we’d been lifelong residents who remembered exactly where it was; never landing long enough for us to get bored with her topic. She truncated each story with a belly laugh or an adorable swear word, for which she would always respectfully apologize. She is the keeper and protector of the phone booth and she is the true legend of the town. I’m so glad we got a few moments with her and hope, on our next trip through Iowa, we can stop at the booth and have a few more words with our newest old friend. 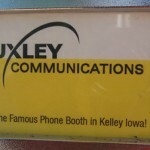 More about the Kelley Phone Booth here.